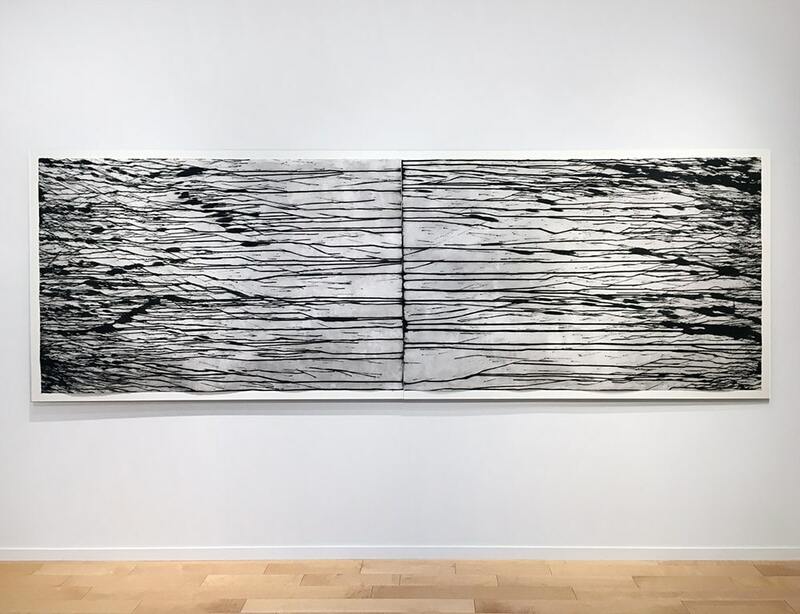 Inspired by a deep connection to his native English Spike Island and the surrounding nature, Richard Long (born 1945) has created a powerful body of work entitled The Spike Island Tapes. Long, an artist who has for many years relished in scenic walks in the rural English countryside is known for his outstanding work in connection to the land. Considered a member of the British Land Artists movement, Long has since the 1960s created impactful large-scale sculpture, paintings, and prints, often derived from actual rocks, bark, and elements found within the scenery itself. His expansive and meditative works have been exhibited in museums, galleries, public spaces, and the great outdoors. Long has traveled the world to places as far reaching from his hometown of Bristol as Antarctica, Japan, India, China, Argentina, South Africa, California, and The Sahara Desert. During his explorations of these vast spaces, he has created unlikely sculptures and installations, cultivated from the earth. While Long gains much inspiration from the natural world around him, he has been particularly influenced by the River Avon, a cherished body of water near his hometown. He has historically used mud directly from the river within his works; The Spike Island Tapes were inspired by the mud of The River Avon. This powerful body of work emulates Long’s intrinsic connection to his roots, his home and its landscape. For The Spike Island Tapes, Long created 12 massive aluminum etching plates, each eight feet long. 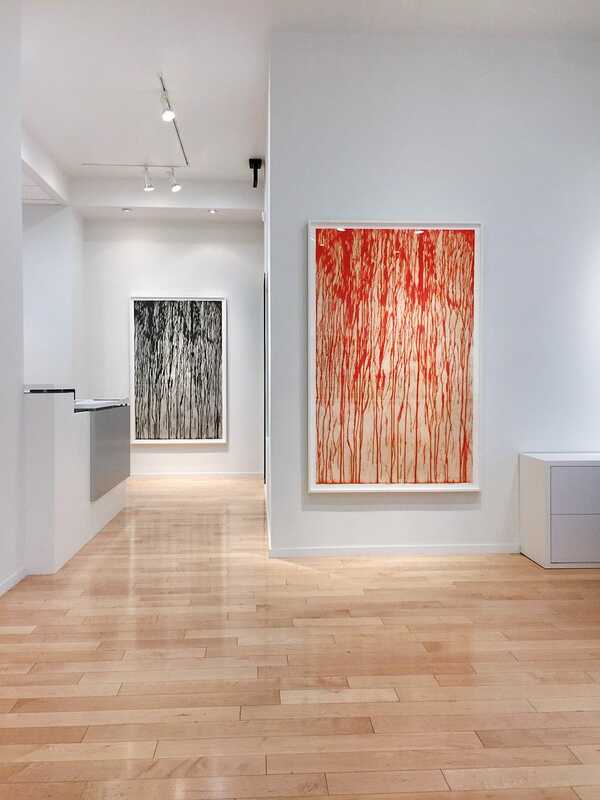 Carborundum, a new medium to Long, allowed the artist to become deeply engrossed within his printmaking process rendering some of the largest prints that he has created to date. These works are filled with tremendous surface texture and motion. An adept printmaker, Long has experience not only in lithography and screen printing but also in etching which intuitively took him to carborundum, yielding The Spike Island Tapes, the most mature and exciting editioned works yet. 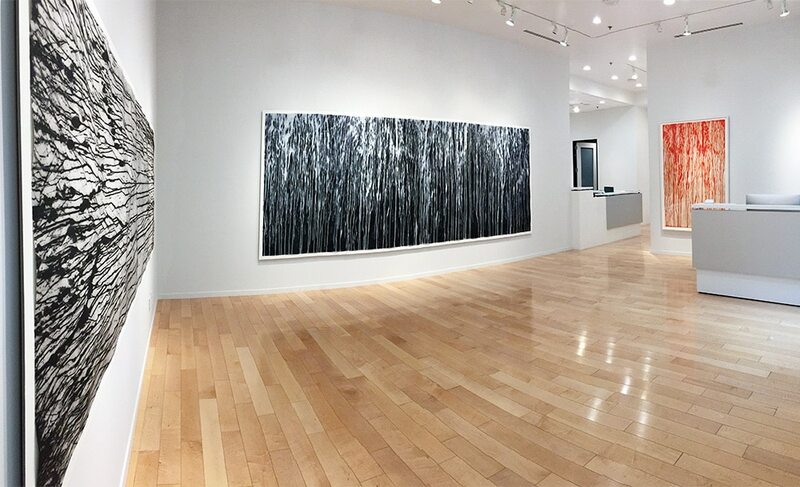 Long chose to present four large sheets together to create one work that could fill an entire wall; Mississippi River Blues is that work, utilizing white ink atop black paper that was washed with black acrylic paint. Hickory Wind, Sweet Old World, The Shaskeen Reel, and The Lark in Clear Air were all selected to stand alone or in pairs in their designated colors of black and red. 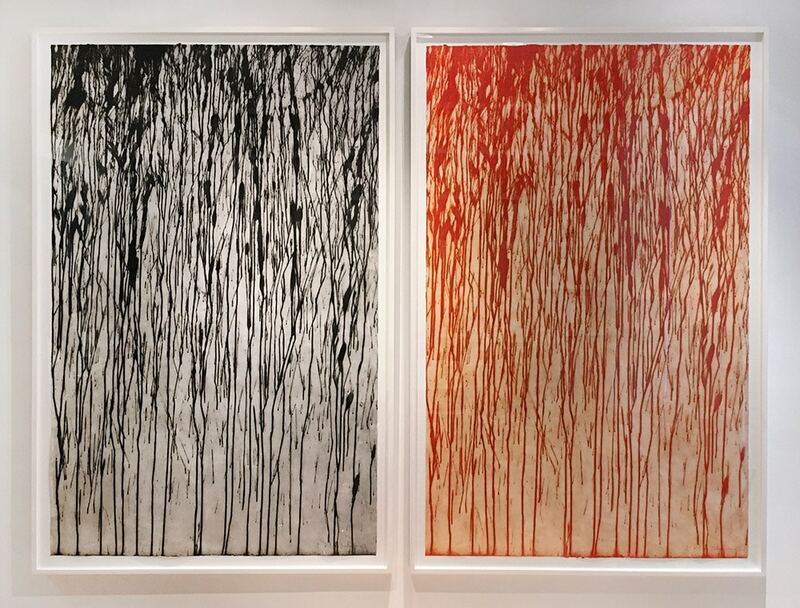 The Speed of the Sound of Loneliness was created as a diptych; the prints were rotated so that the drips faced inward and toward one another with the movement running horizontally. These works are of exceedingly small editions, ranging from two to four impressions of each. Long has exhibited throughout the globe at the following institutions: The Museum of Modern Art (Oxford), The National Gallery of South Africa (South Africa), The Tate Gallery (London), Musée d’Art Moderne et d’Art Contemporain (France), The Scottish National Gallery of Modern Art, The Royal Academy of Arts (London), Museum Kunst Palast (Germany), The Tate Modern (London), The Guggenheim (Bilbao), The Contemporary Arts Museum (Houston), Sao Paulo Biennal (Brazil), and The Guggenheim (New York), and others.